While only 90 percent complete, the sprawling Auger Cosmic Ray Observatory in South America has produced its first major discovery. The international Auger collaboration has traced the rain of high-energy cosmic rays that continually pelts the Earth to the cores of nearby galaxies, which emit prodigious quantities of energy. The Auger collaboration, which includes 370 scientists and engineers from 17 countries, formally announced its discovery in the Friday, Nov. 9 issue of the journal Science. Ten researchers belong to the University's contingent of the Auger collaboration, including Cronin and Angela Olinto, Professor in Astronomy & Astrophysics. 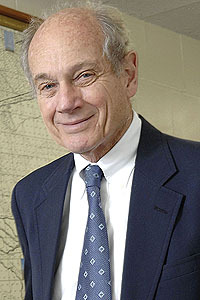 Cronin initiated the project with Alan Watson of the University of Leeds in the early 1990s. Cosmic rays—mostly protons—fly through the universe at nearly the speed of light. The most powerful cosmic rays contain more than one hundred million times more energy than the particles produced in the world's most powerful particle accelerator. Fortunately, Earth's earth's atmosphere provides protection against their potentially harmful effects on humans. Since 1938, when French physicist Pierre Auger discovered high-energy cosmic rays, their origin has been a mystery. Now the Auger collaboration has tracked them to Active Galactic Nuclei. Likely powered by supermassive black holes, AGN shine far brighter than regular galaxies as a byproduct of their gravitationally destructive force. “After decades of negative results from past experiments, Auger physicists finally find that cosmic rays do not come equally from every direction in space,” Olinto said.